There you have it. Straight from the freelancing bachelor’s mouth. Note: Feel free to go all-savory or all-sweet, if you’re so inclined. 8 tbsp ricotta (preferably whole milk) $3.50 for 15 oz. Preheat oven to 450 degrees F. Lightly flour a baking sheet and set aside. On a lightly floured surface, use a rolling pin to roll the dough out until it is about 1/8” thick. Use a small bowl, large glass or cookie cutter to cut the dough into 8 4” circles (feel free to go slightly larger or smaller). Place 1 tbsp of the tapenade on one half of 4 of the circles. Do the same with the preserves on the remaining 4 circles. Place 1 tbsp of ricotta next to each spoonful of tapenade or preserves. Fold the dough rounds in half to form a little calzone. Tuck the ends from underneath the bottom half of the dough over the top half, as on a regular-size calzone. Pinch gently to seal. 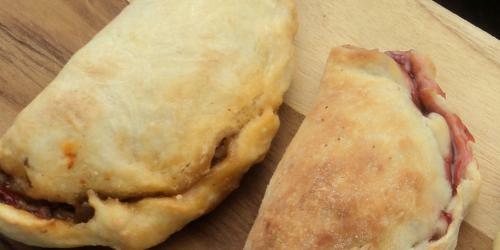 Arrange the calzones on the prepared baking sheet and brush lightly with olive oil. Bake for 12-14 minutes, or until golden brown (don’t worry if a little filling seeps out while baking). Makes 8 small calzones (serves 2-4). Hey, thanks for the work-date tip!!! I work from home too, and it does get lonely sometimes. thanks for the work-date tip!!! I work from home too, and it does get lonely sometimes.